Wishlist Wednesday features books that have been on your wishlist for a long time, old or new. When it comes to relationships, Colin Singleton's type happens to be girls named Katherine. And when it comes to girls named Katherine, Colin is always getting dumped. Nineteen times, to be exact. He's also a washed-up child prodigy with ten thousand dollars in his pocket, a passion for anagrams, and an overweight, Judge Judy-obsessed best friend. Colin's on a mission to prove The Theorem of Underlying Katherine Predictability, which will predict the future of all relationships, transform him from a fading prodigy into a true genius, and finally win him the girl. Letting expectations go and allowing love in are at the heart of Colin's hilarious quest to find his missing piece and avenge dumpees everywhere. 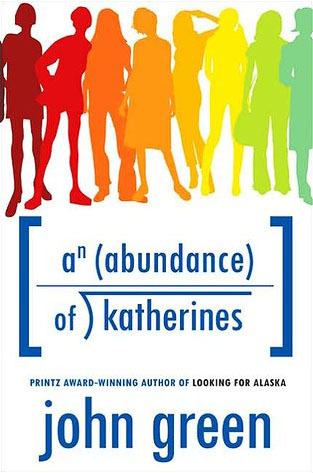 I just read my first John Green, and I pretty much loved it. And my pretty much, I mean, yes. I did. So now I'm determined to read everything he's ever written. Not only does this one sound hysterical, but I love romances with male leads. I don't know why, but sometimes I relate to them more. Maybe because I'm not a super girly girl. Maybe because some romances with girls are super girly. Not all of them, of course! But maybe it's also because awkward male protagonists are adorable, and I love them. You'll have to let me know what you think! I've only read one John Green book and that was Will Grayson Will Grayson which was pretty good :) I need to check out more of his writing! I really want to read them all, but this one looked especially good. This one is on my TBR list too! I love John Green. I cried harder over The Fault In Our Stars than any other book in my recent reading history. Will Grayson Will Grayson and Looking for Alaska are very good as well. Enjoy! I actually didn't cry which I was SO surprised about. I think I just expected to feel sad. I'll have to check those out too! And Paper Towns.